A similar situation arises in image classification, where manually engineered features (obtained by applying a number of filters) could be used in classification algorithms. However, with the advent of deep learning, it has been shown that convolutional neural networks (CNN) can outperform this strategy. A CNN does not require any manual engineering of features. During training, the CNN learns lots of "filters" with increasing complexity as the layers get deeper, and uses them in a final classifier. 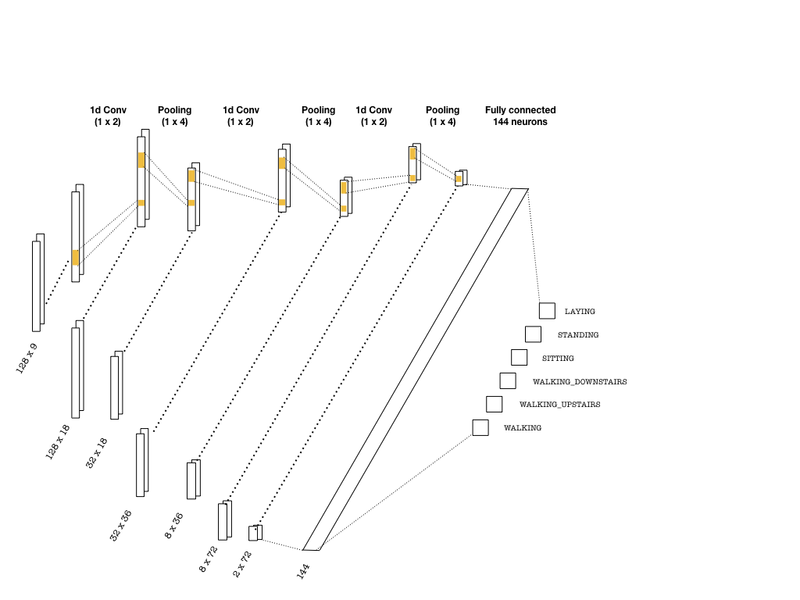 In this blog post, I have illustrated the use of CNNs and LSTMs for time-series classification and shown that a deep architecture can outperform a model trained on pre-engineered features. In addition to achieving better accuracy, deep learning models "engineer" their own features during training. This is highly desirable, since one does not need to have domain expertise from where the data has originated from, to be able to train an accurate model. Thanks for the clarification, I understand the problem better now. The previous LSTM architecture I outlined may work, but I think the better idea would be to divide the ECG time series in blocks and classifying each block. Each block size can be determined by the interval where the 2 humans perform the manual scoring. Let's say the the scoring is performed at each 200 fs. Then, you can divide the whole ECG in blocks of 200 fs. Each block will then be classified as one of 6 sleep stages. So from a given ECG, you will get around 1600/200=8 samples (1600 from the figure you have provided) to classify. In this way, you will have an equivalent problem to the HAR classification. This will also reduce the length of the time-series you will need to classify, since you are using shorter blocks rather than the whole ECG signal. I guess, you can also perform an unsupervised analysis if you do not trust the human scoring. However, I am not sure how that would work. You may need to extract some features from the ECG signals first and then cluster them. Since you already have the labels (the 6 stages) I would vote for using a supervised algorithm first. 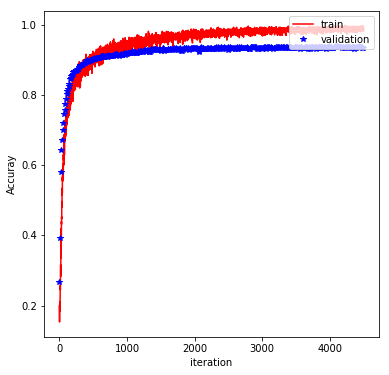 The supervised learning can use LSTM, or some other classifier based on engineered features. Thanks for your prompt reply and support. The sleep stages are manually scored by 2 humans looking at all the data (brainwaves, ECG, breathing, eye moving, etc). And the scores sometimes have discrepancies based on the criteria on the human conducting the analysis, especially in determining when a transition between two stages occurs. The scores are determined in at various intervals in between the ECG signal, for standard polysomnography (sleep analysis), every 30 seconds are given a score. This is a multiclassification problem with 6 sleep stages: wake (score 0), S1( score 1), S2( score 2), SWS( score 3), REM( score 5), Unscored( score 9). Below there are 2 plots with the input time series (ECG signal) and the output time series(sleep stage scores). Another approach to solving this problem could be using unsupervised algorithms, where the model can learn from unlabeled features and identify the sleep stages by detecting the switching in the ECG signal directly, instead of learning from labels scored by humans, what do you think? For clarification, could you explain a bit more how the sleep stage score is computed? Is it calculated in at various intervals in between the ECG time steps? so that at every two time step the output is kept in logits (instead of just the final step). Of course, you will need to change the rest of the code as well to account for the fact that your output has a different shape. Let me know if I understood the problem correctly. 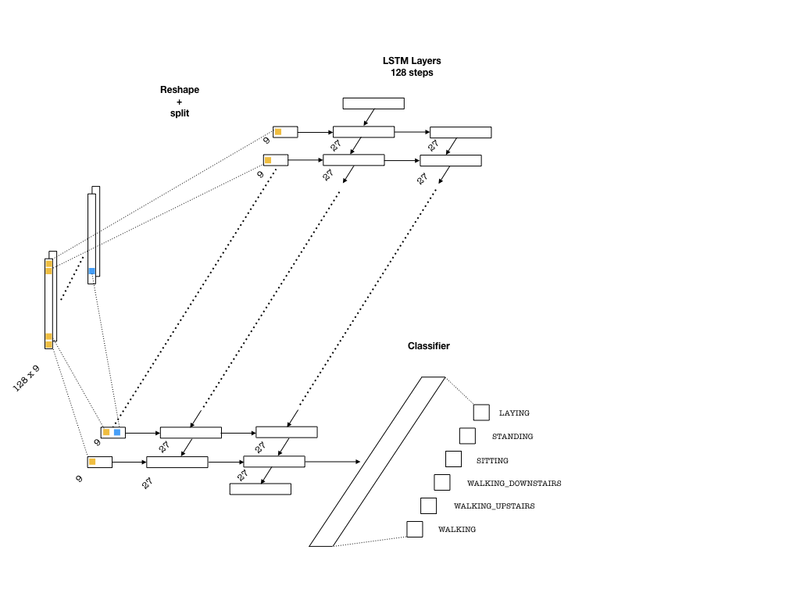 For the second question, I think what you can do is to attach a convolutional layer with a max or average pooling layer before the LSTM cells. In this way, you would reduce the number of time steps. If you look at the notebook HAR-CNN_LSTM.ipynb in my repo, you can see and example of that. I am working on a project for sleep stage classification where the number of timesteps (observations) in the input series (ECG signal) is different than the number of timesteps in the output series (sleep stage scores). I have tried to frame the problem in different LSTM configurations without getting results that make sense, the issue here is that the input and output time series are not equal in terms of timesteps as the examples I have seen with time series problems. Another problem here is the length of the timesteps as you mentioned, on human signals we are dealing with larger sequences, over 1000. Could you please provide recommendations/references on how to approach this problem?